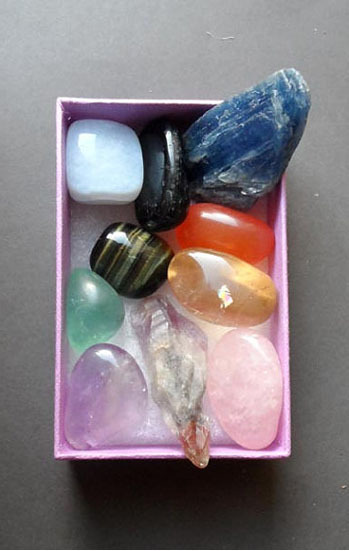 "Super 7 is a combination of amethyst, cacoxenite, lepidocrocite, clear quartz, goethite, rutile and smoky quartz. Even though each piece may not show each mineral all the pieces carry the energy of all seven minerals. It produces electromagnetic waves providing the self-luminous quality and assists one in seeing auras and in maintaining the connection between the physical and ethereal planes. Analogous to Sirius, the "brightest" star in the heavens, it can assist one in all endeavours, promoting conscious awareness of that which has remained hidden for aeons. The Super Seven never needs cleaning or energizing... has been used to promote telekinetic pursuits, telepathy, clairaudience, awareness-channelling, universal creativity, to further healing on all levels." Melody, Love is in the Earth.